Villa Ananda is one of three luxury private villas in the exclusive Jivana Beach Villas estate on Natai Beach, located just 25 minutes north of Phuket International Airport. Set against a lush tropical backdrop, the villa extends languidly over palm-strewn lawns to meet Natai’s pristine white sands, boasting 80 metres of absolute beachfront. Arriving at Villa Ananda gives one a remarkable sense of peace and tranquillity. The slow pace of life in this remote coastal region conjures up dreamy days spent relaxing under the sun, paired with romantic evenings bathed in moonbeams. Nestled within groves of tall coconut palms swaying to the sound of the waves, Villa Ananda is a lavish luxury retreat worlds away from its bustling southerly neighbour, Phuket. Arranged over four elegant contemporary Thai-style pavilions, Villa Ananda’s indoor living spaces are opulently designed with rich teakwood floors and ceilings, fresh white linens and fabrics, and soothing lighting that reflects against whitewashed walls adorned with tasteful art. Each space can be opened with sliding glass doors to allow in fresh sea breezes, or enclosed and air-conditioned. A children’s bedroom with two sets of bunk beds and nanny’s quarters makes Villa Ananda especially suitable for families. A professionally trained resident chef prepares a delicious range of Thai (and some Western) dishes from the villa’s selection menu, allowing guests to savour the enticing flavours of Thai cuisine without having to leave the luxury of their private villa. Fresh, locally caught seafood is a specialty of the region and features in an array of mouth-watering Thai dishes and barbecue feasts. Warm Thai hospitality makes a stay at Villa Ananda all the more memorable and relaxing. The knowledgeable on-site villa manager ensures guests’ needs are met and all runs smoothly at the villa, while the discreet attendants take care of housekeeping duties and provide service at mealtimes. 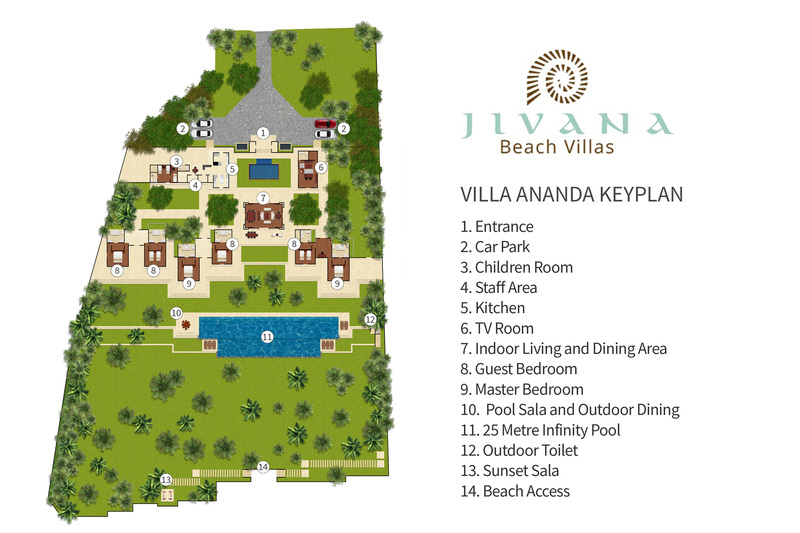 The double entrance doors of Villa Ananda open up onto a courtyard with granite water feature and soothing pond. Views from here are of the impressive, centrally located ‘Great Room’ and the sea beyond. To the left of the courtyard is the family room and TV lounge; to the right the kitchen and children’s quarters. Either side of the ‘Great Room’ are the two bedroom pavilions. Spread luxuriously across the front of the villa is a 25-metre pool and expansive lawn with relaxation and dining salas. Villa Ananda’s elegant indoor living areas are perfectly designed for peaceful relaxation and dining. Commanding most of the attention is the centrally located ‘Great Room’ with comfortable sofas and ottomans providing plenty of lounging space. Adjacent is a long dining table that can seat up to fourteen guests. To the left of the ‘Great Room’ is a fully equipped kitchen. On the opposite side is a cosy family room with built-in cabinets housing an extensive library of books and DVDs. The room is equipped with a 40-inch flat-screen satellite TV and sound system, and comes complete with lounge seating, a games table and small office space for those with business to attend to. Next to the family room is a guest bathroom. To the front of Villa Ananda is a stylish 25-metre infinity pool with shallow section for children, and an immense lawn that stretches to the sea. This beautiful beachfront garden is shaded by tall coconut trees and offers the perfect setting for outdoor games. Six poolside sun loungers line the pool deck, with a convenient guest changing room and shower nearby. Within the garden is a sunken dining sala with seats for eight and a beachside relaxation sala – the ideal spot for in-house spa treatments. The breezy veranda in front of the ‘Great Room’ is furnished with cushioned rattan seating, and offers ample space for alfresco dining. Villa Ananda’s six main bedrooms are housed in two contemporary Thai style pavilions with vaulted ceilings, rich teak wood features, whitewashed walls, desks and elegant ensuites. Each is equipped with air-conditioner, ceiling fan and sliding glass doors that lead to garden areas. All six of these rooms have unobstructed views of the sea and enjoy easy access to shared verandas and courtyards. A separate children’s bunk room with nanny’s quarters lays towards the back of the villa, providing ample space for kids to play and sleep. The two master suites, one in each pavilion, are the largest of the six bedrooms and offer comfortable private spaces with intimate lighting. They come furnished with four-poster king-size beds dressed in crisp white linens, and soft-cushioned armchairs. Large teak wardrobes separate the bedrooms from the generously sized marble and terrazzo ensuites. Included are deep built-in bathtubs, his and hers sinks, rain showers and enclosed tropical gardens set behind glass walls. The master suite to the left of the ‘Great Room’ shares an office space with an adjoining twin bedded room. The two king-bedded guest rooms are furnished with plush mattresses dressed in fresh white linen, comfortable rattan armchairs and ottomans, teak writing desks and large wardrobes. Their ensuites include rain showers, his and hers sinks and granite bathtubs set within private tropical gardens. These two rooms are furnished with twin size beds that can be combined to form king beds, and comfortable armchairs. Their terrazzo and marble bathrooms are identical to the neighbouring master suites, and include deep built-in bathtubs, rain showers, his and hers sinks and enclosed tropical gardens set behind glass walls. The children’s bedroom that accommodates below 12 years old and nanny’s quarters, set quietly and securely towards the rear of the villa, are unique features of Villa Ananda. The large children’s room is furnished with two sets of bunk beds and equipped with a variety of toys, books and a 30-inch flat-screen cable TV with DVD player. Its ensuite bathroom comes with special kid-sized fittings. Attached to the children’s room is a nanny’s room with direct access to the staff and kitchen area. 16 people (12 adults and 4 kids) in 7 ensuite bedrooms: 4 with king beds; 2 with twin beds (convertible to king-size beds) and two sets of bunk beds for kids below 12 years old. Great Room’ living and dining pavilion with dining for 14; family room with TV; furnished veranda; dining sala with seats for 8; beachfront relaxation sala. 25 x 5 x 1.4 metres, with shallow section for children. Villa manager; private chef; villa attendants; security; groundskeeper. Additional staff (babysitters, masseuses) available on request (extra charges apply). Complimentary WiFi internet; landline for local calls. Satellite TV; DVD player; iPod dock and speakers; book, music and film libraries; board games. Villa Ananda is exceptionally well equipped for families. As well as a children’s bunk/play room and attached nanny’s room, facilities include a baby cot, high chair, CDs/DVD’s, board games and toys (including pool toys). In villa treatments selected from a comprehensive spa menu can be carried out by professional therapists (extra cost applies). Complimentary 1 x airport pickup. Barbecue; backup generator; safety deposit box; 2 kayaks; 2 bicycles. 9,500 sqm (land); 658 sqm (villa).